- Sari Colt on 十二月 22, 2016. On a chilly Friday evening, we entered the iYellow Wine Cave for the FRESH Wines portfolio tasting. 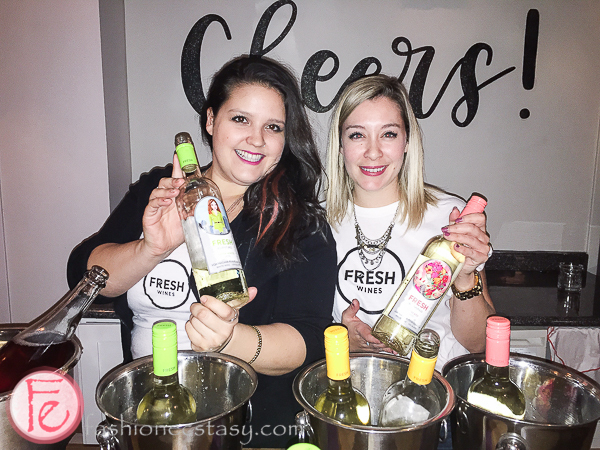 FrESH Wines is an exciting line produced by Diamond Estates in Niagara. These are VQA wines, made from 100% Ontario grapes. The Fresh message is that life is about the journey and these wines can be part of that self- discovery. We started off the evening by nibbling on gourmet cheese and charcuterie before immersing ourselves in the tasting of the six wines in the collection. FRESH Ideas Sparkling Riesling 2014 (100% Riesling) was light, sweet and fruity. It’s perfect for pairing with salads, cheese or even desserts. FRESH Possibilities Sparkling Rose 2014 (60% Riesling and 40% Gamay) was flavourful and has notes of strawberry and cherry. It can be enjoyed with anything salty or sweet. FRESH Adventures Crisp White 2015 (65% Riesling and 35% Moscato) tastes like a juicy green apple mixed with tropical fruit. It Would go well with fish or creamy cheeses. FRESH Opportunities Riesling Gewurtztraminer 2014 (60% Riesling and 40% Gewurtztraminer) has spice and hints of orange and tangerine. It Would be great to pair with spicier dishes. FRESH Beginnings Moscato 2015 (100% Moscato) is light and refreshing with both pear and citrus notes, which Would beautifully complement a grilled seafood or spicy dish. FRESH Perspectives Satin Red 2014 ( 60% Shiraz and 40% Merlot) is smooth with berry and pepper. It Would work well with meat and heavier dishes. It was quite enjoyable to taste this collection of wines. Fresh Wines are available across Ontario and in Alberta, Saskatchewan, and Manitoba.